The Tesla M4 GPU brings the power of the Tesla Accelerated Computing Platform to the hyperscale data centre. This is a low-power, small form factor GPU accelerator optimised for video transcoding, image processing, and machine learning inference that efficiently offloads demanding applications and boosts data centre throughput. Learn More. The Tesla M40 GPU Accelerator is purpose-built for deep learning training and is the world's fastest deep learning training accelerator for data centre. 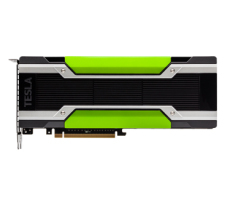 Tesla M40 is based on NVIDIA Maxwell™ architecture and a Tesla M40 server outperforms CPU server by 13x. Learn more. The Tesla M6 GPU Accelerator is designed specifically for data centres that are virtualizing desktop graphics. It comes in an MXM form factor running at less than 100W for high-density data centres with blade servers and converged infrastructure and can support 16 concurrent users. Find out more about GRID technology. This accelerator is designed specifically for data centres that are virtualizing desktop graphics. It's a dual-slot PCI Express form factor for rack and tower servers capable of supporting 32 concurrent users. Find out more about GRID technology.